Known as the “City of Pleasant Living,” Shelby, North Carolina has a rich musical heritage, world-class entertainment venues, lively wineries and festivals, a growing brewery scene and some of the best barbeque in the South. Home of legendary bluegrass and country songwriters Earl Scruggs and Don Gibson, Shelby’s classic sounds are invigorating a new generation of musicians, like local band Acoustic Syndicate and the artists behind the city’s annual Art of Sound music festival. Visit the Earl Scruggs Center, a state-of-the-art facility dedicated to the man who mastered the five-string banjo and the 400-seat Don Gibson Theatre, or catch some live jazz over a glass of wine or craft beer at the Dragonfly Wine Market. Other local eateries, breweries and wineries include the award winning Red Bridges Barbecue Lodge, voted the Best BBQ in America by more than 250,000 Thrillist readers, Shelby Café, featured on Food Network’s “Diners, Drive-ins and Dives” for its famous livermush, Newgrass Brewing Company and Owl’s Eye Vineyard & Winery. Other favorite local spots include the Foothills Farmers’ Market, offering fresh produce and live music every Saturday from April through November, and boutiques and shops like Uptown Olive Oil & More, RollOver Pets and Peace Avenue. On top of all that, Shelby’s convenient location puts you just 35 minutes from the Charlotte Douglas International Airport and 45 minutes from Downtown Charlotte, making any kind of travel — from daytrips to international flights — as easy as pie. 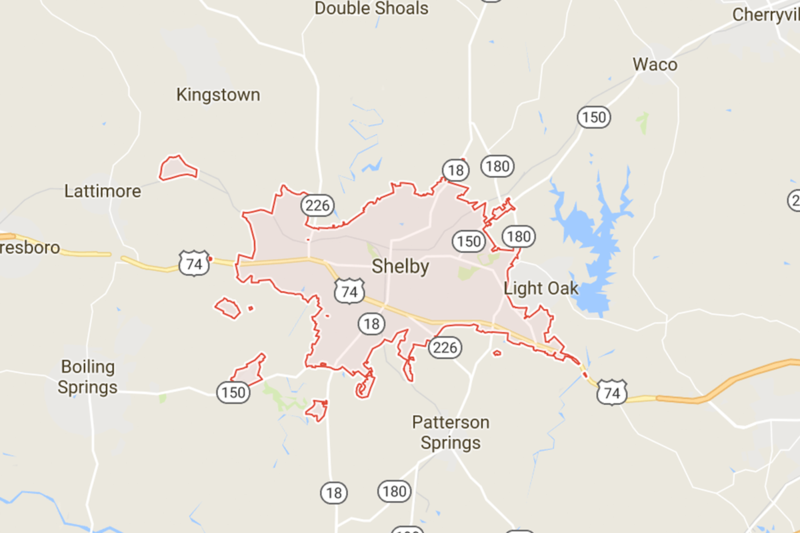 Fun fact: fans of The Hunger Games trilogy will recognize Shelby as the site of District 12 in the blockbuster movies. Located minutes from two breathtaking state parks and home to a 1,660-acre lake, the City of Kings Mountain, North Carolina is the place to be for outdoor adventurers. Crowders Mountain State Park, located less than 10 minutes away by car, offers rugged terrain and towering cliffs that are perfect for hiking, rock climbing and bouldering, complete with 25-mile views of the surrounding piedmont. The park’s nine-acre lake offers choice spots for fishing and canoeing. Across the border in South Carolina is Kings Mountain State Park with its miles of forested trails, two fishing lakes and one of many national park Revolutionary War sites. Located in Kings Mountain on the border of Shelby, Moss Lake encompasses more than 2,000 acres, with 57 miles of shoreline and 1,660 acres of water – offering plenty of opportunities for fishing, waterskiing, picnicking and camping. For families with young children, Kings Mountain’s Patriots Park is a popular venue for concerts, ceremonies and family-friendly festivals, like the annual Beach Blast, which features an all-day free concert, water games and a watermelon eating contest. 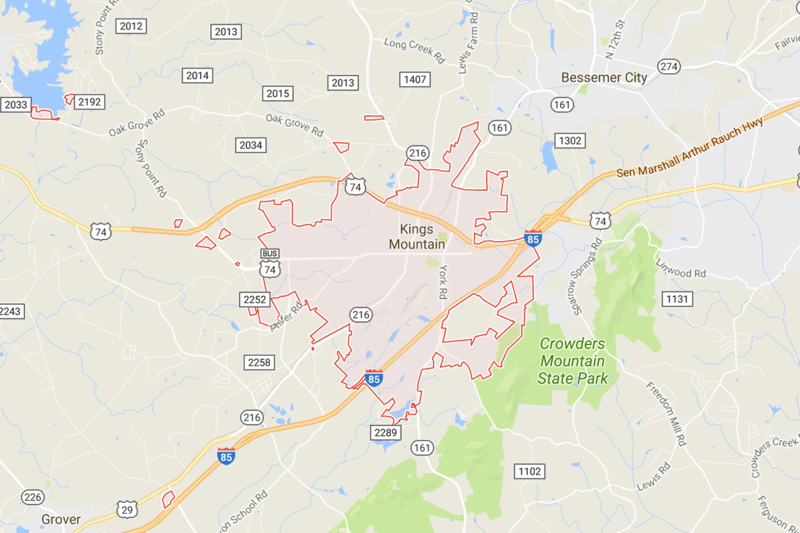 With easy access to I-85, US Highway 74 and US Highway 29, Kings Mountain residents are just 25 minutes from Charlotte Douglas International Airport, 35 minutes from Downtown Charlotte and less than an hour from Spartanburg, South Carolina. 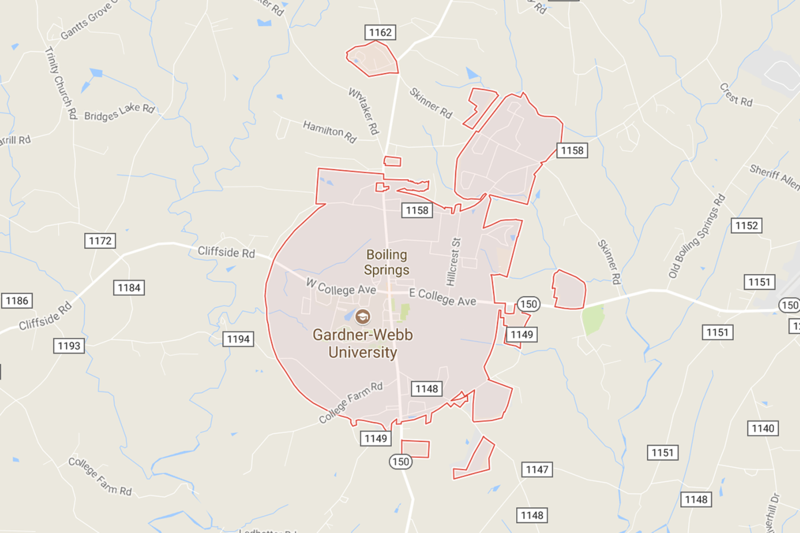 Home to Gardner-Webb University, the cornerstone of Cleveland County’s education ecosystem, Boiling Springs is much more than a university town—it’s a thriving community with easy access to outdoor recreation opportunities, two major airports and cities in North Carolina and South Carolina. Boiling Springs’ crown jewel is the Broad River Greenway, a 1,500-acre greenway with space to horseback ride, hike or picnic. Nature lovers will revel in the Broad River, which flows from the Blue Ridge Mountains and empties into the Atlantic tidewaters, providing a safe haven for a variety of animals and plants—and a perfect place for kayaking and tubing. Boiling Springs’ location to the west of Shelby puts residents just 45 minutes from Spartanburg, South Carolina, less than an hour from both Greenville-Spartanburg International Airport (GSP) and Charlotte Douglas International Airport and just over an hour from Asheville, North Carolina. Fallston, North Carolina is a hamlet in Cleveland County that offers some of the best food and drink around. Fallston is home to the family-owned Baker Buffalo Creek Vineyard and Winery, a beautiful setting that’s perfect for wine tastings, special occasions and outdoor events. Other local favorites include Jan’s Restaurant, a family-owned, family-style eatery and The Local Market, a farm-to-table restaurant that serves decadent sandwiches and other dishes using delicious local ingredients. 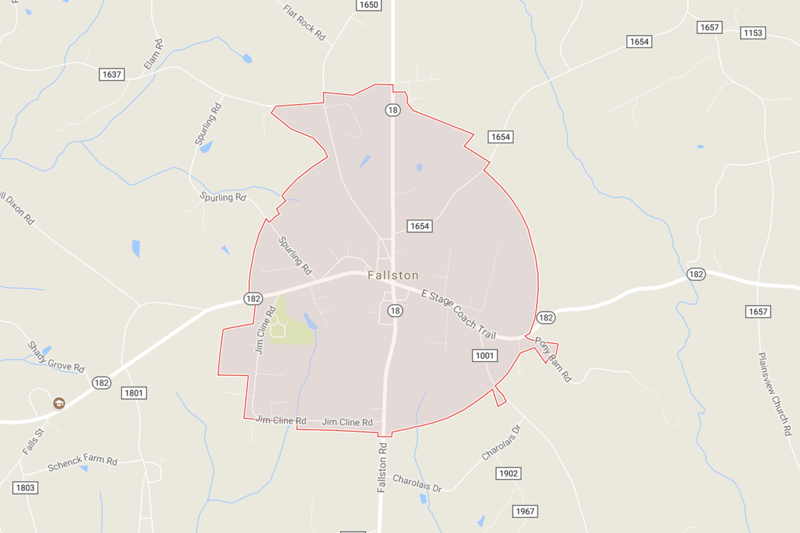 With convenient access to I-85 via Highway 74, Fallston is less than an hour from downtown Charlotte and Charlotte Douglas International Airport. 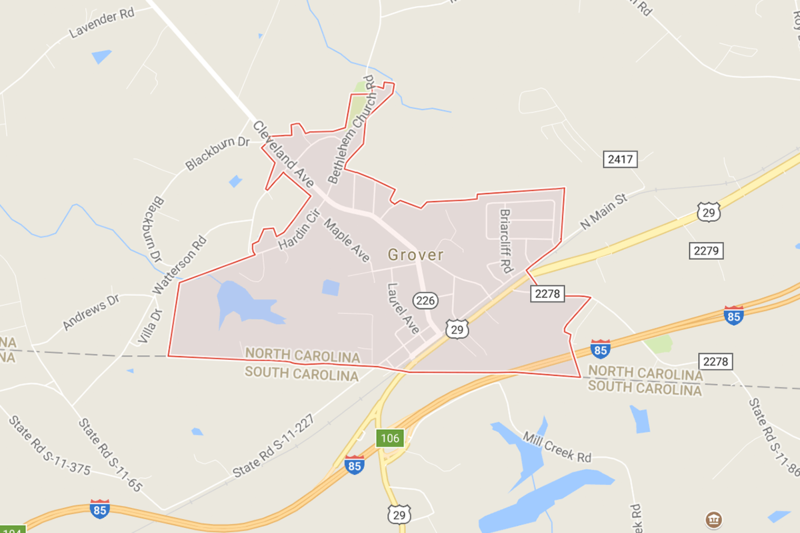 Named after U.S. President Grover Cleveland, Grover is a small, colorful railroad town located near the North Carolina-South Carolina state line, just off of I-85. Grover is now home to Cleveland County’s first Chinese manufacturer, Uniquetex, which will manufacture engineered nonwoven fabrics at its 360,000-square-foot facility. Grover is home to several other international companies, including Eaton, Southern Power and Commercial Vehicle Group – plus, the quirky Presidential Culinary Museum and Library, which showcases the private and public collections of a former White House executive chef. Located directly in between Charlotte, North Carolina and Spartanburg, South Carolina, Grover provides direct access to I-85, making inter-state travel and access to the Charlotte Douglas International Airport virtually seamless. 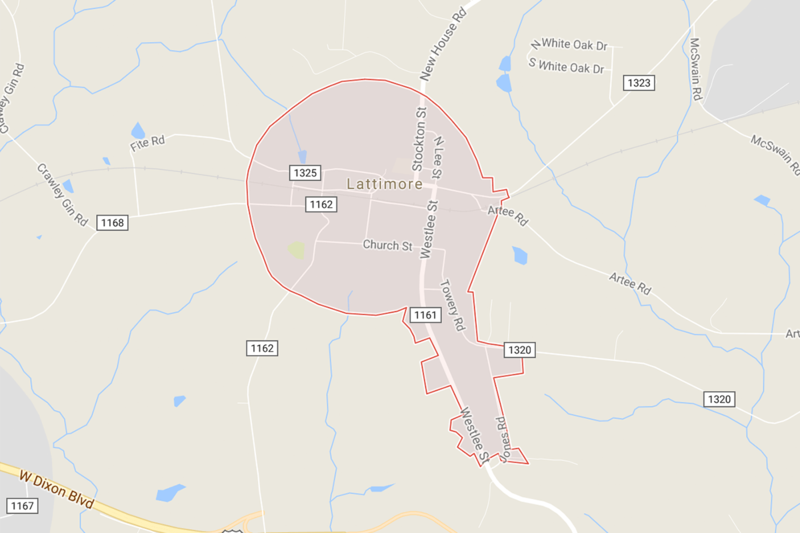 Lattimore, North Carolina is a friendly, peaceful Cleveland County neighborhood with history in spades. Lattimore is the home of Ambassador Baptist College, a private Bible college, and the Lattimore Historical Museum, a museum formed by locals in 2010 to preserve the legacy of the town’s agricultural history and famous local citizens. Well-known former residents of Lattimore include writer Martha Mason, a polio survivor who lived 61 of her 72 years in an iron lung, and N.C. House representative Jack Hunt. The town is also home to The Depot, a popular spot for home-style, Southern cooking, located in Lattimore’s historic train depot. Lattimore’s convenient location puts residents less than an hour from both Charlotte Douglas International Airport and Greenville-Spartanburg International Airport. 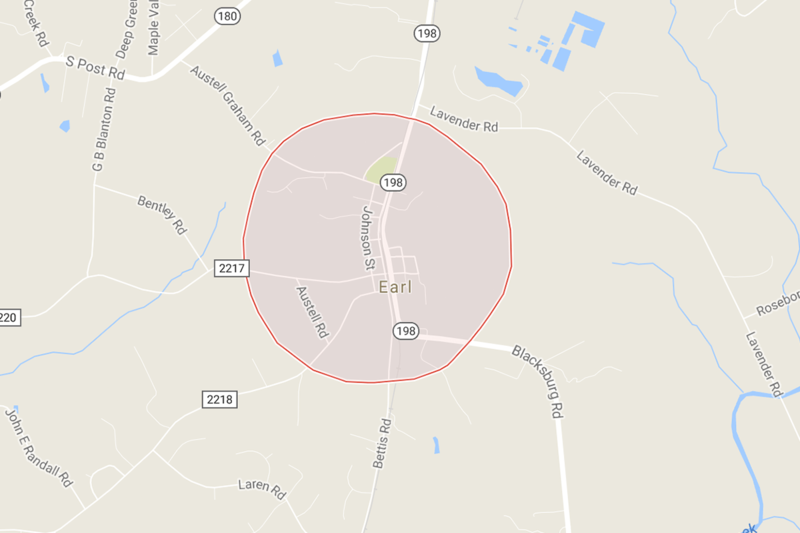 With a total area of just 0.8 square miles, Earl, North Carolina is a small town in the northern region of Cleveland County. Despite the town’s size, its close proximity to I-85 puts residents within reach of major metropolitan areas. In fact, Earl is just 40 minutes from the Charlotte Douglas International Airport to the northeast and 40 minutes to Spartanburg, South Carolina to the southwest. Within Cleveland County, Earl is just 15 minutes from the heart of Uptown Shelby – where you’ll find music venues, festivals and a local brewery – and 20 minutes from Boiling Springs, the home of Gardner-Webb University and the scenic Broad River Greenway. Polkville, North Carolina is a small city in the northern portion of Cleveland County. Every summer, residents enjoy the Polkville Rodeo, an annual event held at the Mintz Arena at Polkville Baptist Church, sanctioned by the International Professional Rodeo Association (IPRA). The city is also home to Polkville Park, which features a picnic area, playground and nature trail. 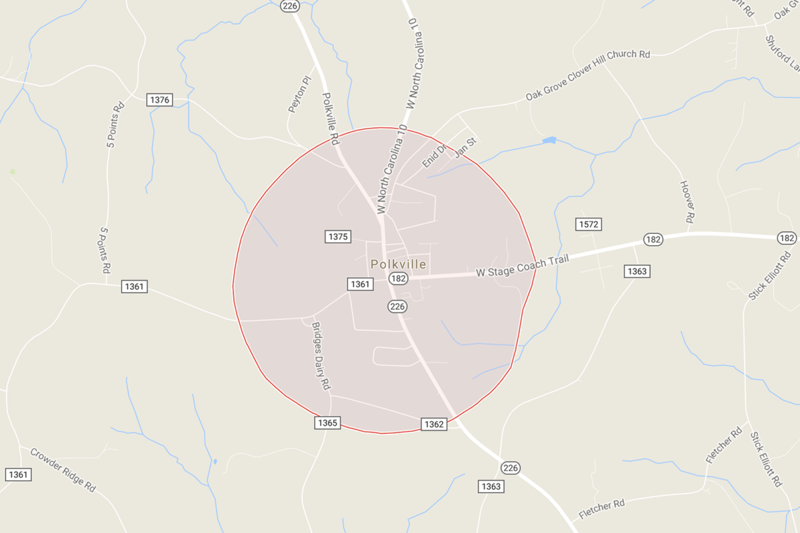 Located less than an hour from Charlotte Douglas International Airport and less than thirty minutes from South Mountains State Park, Polkville benefits from direct connections to North Carolina Highways 226, 182 and 10. NC 226 passes directly through the center of the city, leading to Shelby, 12 miles to the southeast, and to Marion, 31 miles northwest over the South Mountains. Casar, North Carolina is a small town in northern Cleveland County. Families with young children will appreciate the close proximity to a great education for Pre-K-5 at the Casar Elementary School. Caser is also famously home to Knobby, a six-fingered, big-foot creature that, according to locals, has lurked in the woods of Cleveland County since the 1970’s. The town is located less than 20 minutes away from South Mountains State Park, which features an 80-foot waterfall, mountain streams and more than 40 miles of trails for hikers. 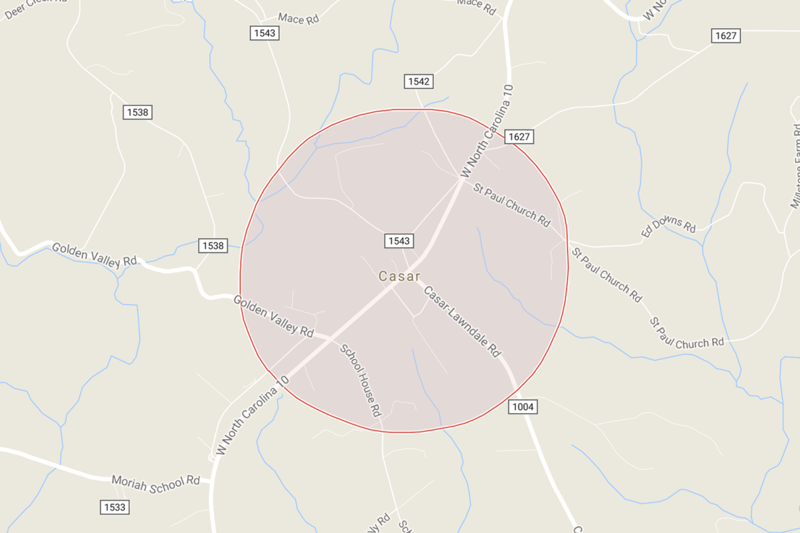 Casar is also just over an hour from both Charlotte Douglas International Airport and Greenville-Spartanburg International Airport. Belwood, North Carolina is a town of more than 950 in northeastern Cleveland County on the border of Lincoln County. Houses are more spread out than in many surrounding areas, and Buffalo Creek winds its way throughout much of the area, making Belwood a lovely, quiet place to live and raise a family. North Carolina Highway 18 passes directly through the town, leading south 14 miles to Shelby and north 25 miles to Morganton, a city in Burke County, North Carolina. 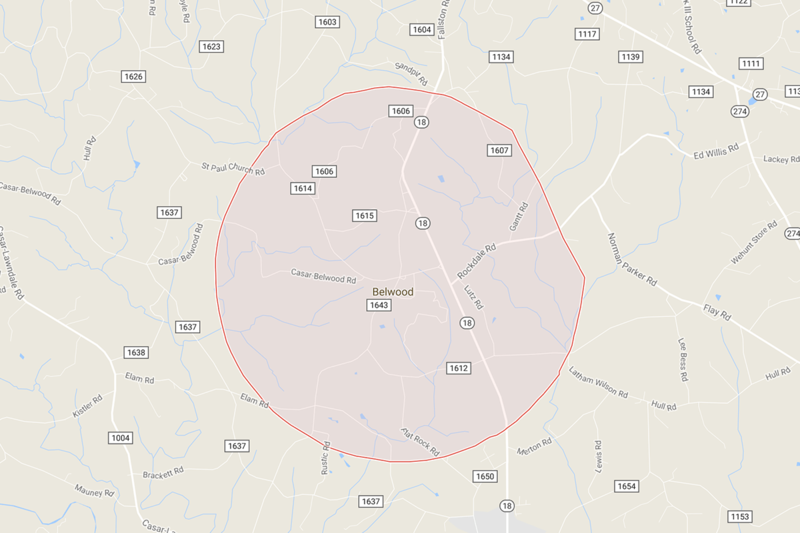 Belwood is just over an hour from Charlotte and Asheville and less than an hour from Charlotte Douglas International Airport. Kingstown, North Carolina is a suburban town of nearly 800 residents located centrally in Cleveland County. Named in honor of Martin Luther King Jr., the town holds an annual parade celebrating the life and message of Dr. King. The town is home to a large African American community and welcomes residents from all backgrounds. 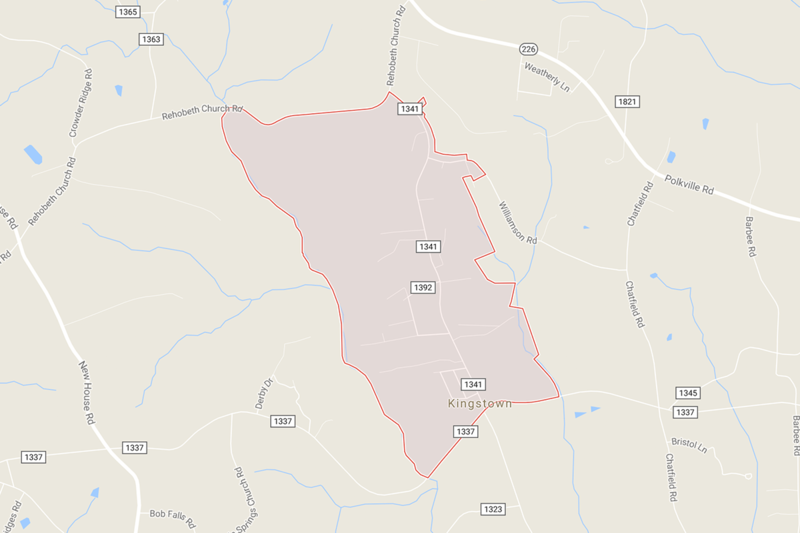 Located just 15 minutes North of Shelby, Kingstown is less than an hour from Charlotte Douglas International Airport and just over an hour from the Greenville-Spartanburg International Airport. Located at the south end of conjoined North Carolina State Highways 180 and 226, Patterson Springs is a small town with excellent access to the surrounding county and major cities and attractions beyond. Local State Highways 180 and 226 provide connection to U.S. Route 74, which means the ride to Charlotte Douglas International Airport is less than 40 minutes. Fans of late night comedy will appreciate this next fun fact. In the satirical TV show The Colbert Report, Stephen Colbert repeatedly mentions that he spent his early TV career at the fictitious TV station WPTS, which is situated in…you guessed it: Patterson Springs, North Carolina. Located in the eastern portion of Cleveland County, Waco is a town steeped in history and local legend, and a great place to raise a family. First known as “Ramsey Crossings,” after local farmer Joe Ramsey, Waco was later renamed after Waco, Texas by a young man who had just returned from traveling in the Brazos Valley. Waco has since come to be known as Home of Floyd Patterson, World Heavyweight Boxing Champion and Olympic Gold Medal Winner. The town’s eastern location in the state provides easy access to Charlotte and Charlotte Douglas International Airport, as well as attractions throughout the county in Shelby and Kings Mountain. 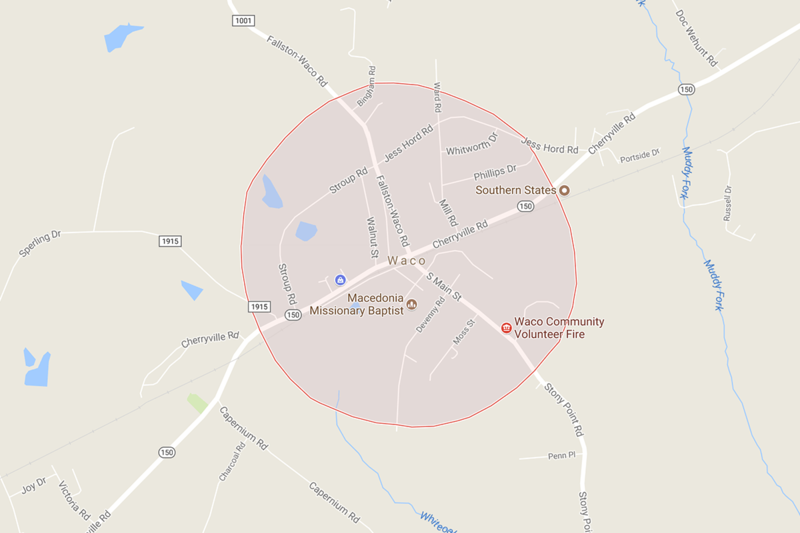 As the most western town in Cleveland County, Mooresboro, North Carolina offers convenient access to major points in North Carolina and South Carolina. 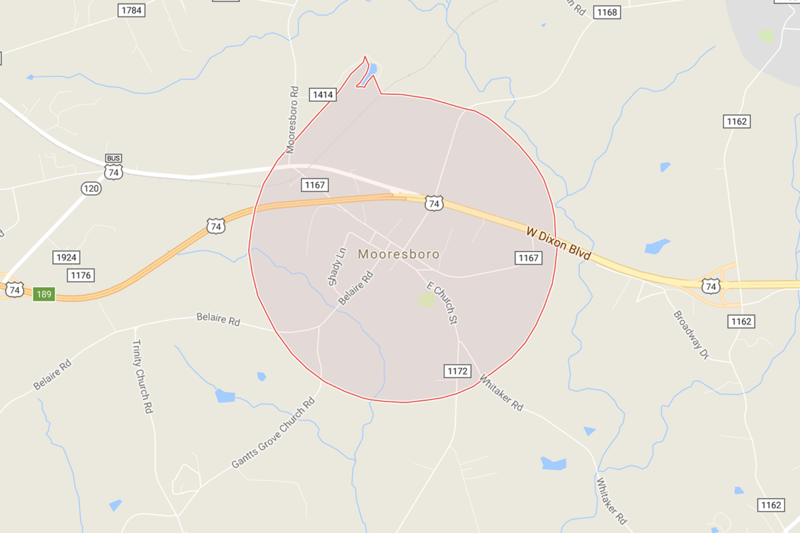 Mooresboro is 45 minutes from Spartanburg, South Carolina just over an hour from both Greenville, South Carolina and Asheville, North Carolina, and less than an hour from Charlotte Douglas International Airport and Greenville-Spartanburg International Airport. 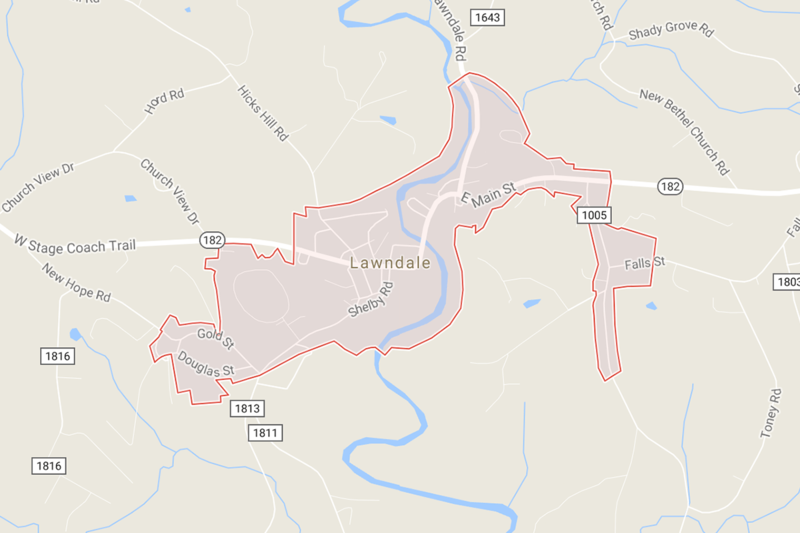 Located along the First Broad River, Lawndale, North Carolina is a river town situated centrally in Cleveland County. Home to the popular Knob Creek Orchard and Creamery, known for its homemade ice cream, and other local eateries, Lawndale is a destination for the foodies of Cleveland County. RedBone Willy’s Trading Co., another local favorite, features unique clothing, gifts, homemade ice cream and live music by local musicians on the porch every Saturday. The town is also home to the Cleveland County Speedway, a dirt track that will satisfy those with a need for speed. Lawndale is less than an hour from Charlotte Douglas International Airport and just over an hour from Asheville, North Carolina, Greenville, South Carolina and Spartanburg, South Carolina.